Making electricity from plants? The idea may at first seem preposterous but Barcelona-based startup Bioo has actually turned it into working technology, with a number of potential applications. “I want to develop technical things that can create change,” says Pablo M. Vidarte, Co-founder of the company. Bioo’s technology is based on a biological engine that obtains energy from the decomposition of organic substances naturally expelled by plants. This causes no harm to any living organism and opens great perspectives for renewable energy production. Staying true to values such as innovation, eco-friendliness and sustainable development, Bioo aims to bring nature and technology together through products that improve quality of life. 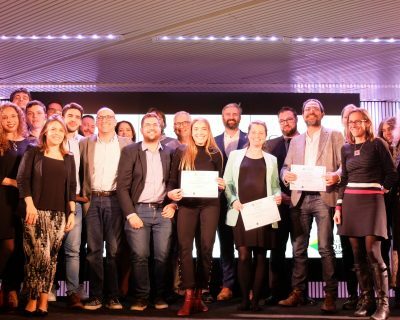 The start-up recently won the EU Young Entrepreneurship Award 2018. Hi, Pablo! Please tell us how everything started in 2015! I initiated this project with a friend of mine who was studying nanotech. We basically started searching for investigations all around the world about things like water treatment. We then developed our own research and created our own prototype to generate electricity from plants themselves. Our first prototype created a little energy. At the beginning it was not a lot, but the plants were producing energy after all, so it was pretty inspiring. So, we kept on working to improve this prototype until we obtained one that produced a lot more energy. Then we decided to start a company, because the best way to finance a project is to make it commercially profitable, or at least to start making a professional structure. So this is how and why we started our company. How come you went from studying engineering to making electricity using plants? It’s not really thanks to engineering that we started Bioo. The reason that made me start studying engineering is actually the same reason that motivated me to create a project like Bioo. I want to develop technical things that can create change. Something that inspires you, beyond what you think you are capable of in the first instance. How did you build the team of Bioo, and how did you meet your different partners? At the beginning it was me and Javier Rodríguez. He is the COO and was studying nanotech. I have known him since studying for our B.Sc. We are both from Andalusia and went to Barcelona to study. Javier is also a co-founder. We met the other people who joined afterwards, thanks to very good coincidences, for example, during events. For instance, we met our first Financial Officer and we essentially started the company with him, however he unfortunately decided to leave during the middle of the race. The first people we worked with, we met them thanks to advisors and universities. How did you start from a financial point of view? Did you get private funding, public funding, or both? And what about now? How does it make a difference for you? project because they had labs nearby. This was really good for us, because we did not want to create our own labs. the EU (€1.8 million) and was supported by the Horizon 2020 program. It was a very big step forward for us. It allowed us to grow our team exponentially and to launch production of a starting product. Now, we are competing for a final round of €650.000. If anyone is interested it’s still open. In case a reader wants to bid, please contact [email protected]. And which one do you prefer: public or private funding? Of course a grant is pretty good. But I would also say, don’t be afraid of investors, because a good investor can really help you, and it’s not only about money. You can find great support in investors if you really know how to look for a good one. You recently won the EU Young Entrepreneurship Award 2018. Can you explain what it is, how the selection process worked, what it represents to you, and what it is going to change for Bioo? That program was very cool. It is directed by the American chamber of Commerce (AmCham) in Europe. We had to make several presentations; the first was online, and then we had to pass several phases. We finally met in Brussels and received the award by AmCham. It basically helped us a lot with our impact in Europe via the media. We were already quite renowned worldwide, thanks to all the competitions we had won and the different media that we had approached, but never as well known in Europe. The impact has been huge. Apart from that, AmCham also gave an economical price of €10,000. which was pretty good. It will help us to develop a prototype of the next version of biological batteries. The good thing here is not the money, but rather the approach to the media. Let’s talk now a little more about the project itself of Bioo. Basically, you use plants’ photosynthesis to generate electricity. How far are you now? Are products already available, or are you still developing the technology? launch other products that are ready. This is our second section. These products are basically meant to create a global awareness, so people know about the technology, and they assume it is a normal renewable resource. Plus, this will of course finance our R&D. Right now, for instance, we are selling Bioo-Ed, which is concerned with education. Our goal here is to educate younger generations and to improve educational methods. Bioo-Ed is a product that allows you to create your own biological battery, to light-up LEDs and other things for instance. You do everything on your own, using plants and substrate. We tried it in a lot of educational centers, and not only the students but also the teachers loved it. Apart from that, Bioo Pass will also be launched next year: this will provide you Wi-Fi access just by placing your phone next to it. It’s not actually a router, it gives you the password for the router. It is mainly targeted towards the hotel, coffee shop and restaurant sectors. What would be your dream for Bioo in let’s say 5 years? What do you want to achieve and what are your objectives? What we want to create is a revolution in cities and agriculture. We want to make a symbiosis between nature and technology, in a way we have never thought of. We know about renewable sources of energy, but we have never seen something that combines with nature in such a way. In this case, we are talking about 100% green energy. Our dream is to make that possible, so cities can profit from their own parks and forests. Also, in agriculture, fields would not only be growing crops, but would also carry solar stations on them. So our dream is to make this possible in this century. To finish with, could you tell us what is the biggest challenge for you, as Bioo’s CEO, and what skills an entrepreneur must have to become successful? The most difficult thing when talking about creating a company is to find the perfect team. Once you have it, you basically have everything. There were actually two major challenges: one was to make people believe our technology is indeed possible. And we achieved this by showing them how the technology works and showing them the products themselves. Therefore, one of our main focuses is to display this technology to the whole world and create a global awareness. Investors and the public want the same thing: to see for themselves that this technology actually works, and also how it works. This challenge was in fact pretty easy to solve, but it was time consuming. The other challenge that was very hard to solve in the beginning was to replicate the biological battery. We could make prototypes; the problem was to industrialize these prototypes. It took us a long time, but it was very critical. We passed that phase, but it was really challenging. What I recommend to someone who wants to be an entrepreneur, is of course to try to develop a good idea, but the team is just as important, if not more important. The great majority of entrepreneurs don’t even have a good idea; they actually have a good team. And with that team, you can create and improve that idea. So, trust the people you find, but don’t be foolish, you won’t always find good people, so act accordingly. Don’t worry if you feel like you’re hitting your head against a brick wall, that always happens and you will learn a lot from it. IMAGINE IF! Final: Barcelona announces the winners!